Rosslyn is a hub for bike trails radiating out across the metropolitan area, throughout the eastern seaboard, and reaching all the way to Portland, Oregon. Rosslyn is regularly the largest pit stop on Bike to Work Day. In short, Rosslyn is the capital of biking in the capital region. 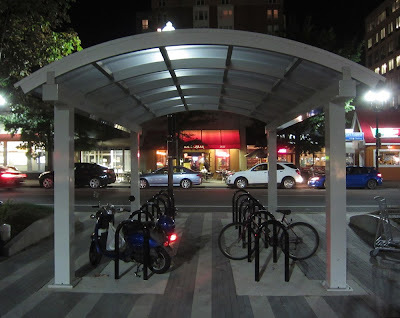 The recent installation of covered bike racks in Clarendon threatens Rosslyn's stylistic eminence in bike parking. Rosslyn has well-recognized stylistic leadership in open bike racks with its artispherical bike racks, its art-deco bike rack, and its folk-art bike posts. Rosslyn also has covered bike parking hidden within the Rosslyn metro station. But that Rosslyn bike parking is significantly less stylish than the new Clarendon bike parking. 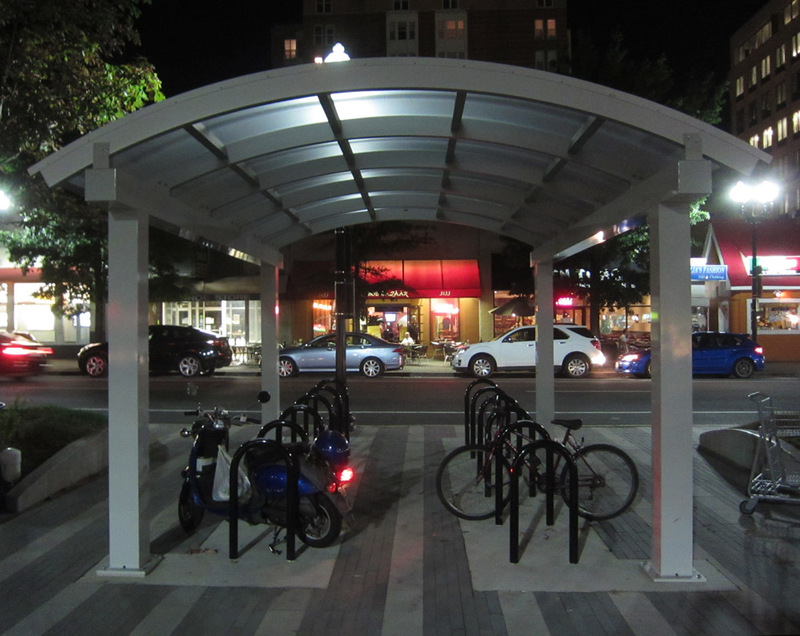 Rosslyn needs to strengthen further its covered bike parking to put down the new challenge from Clarendon. The upcoming Radnor/Ft. Myer Heights Civic Association (RAFOM) meeting undoubtedly will discuss a forceful response to Clarendon. The meeting will address "Bicycle and Pedestrian Issues in Arlington and at the Iwo Jima Memorial." Speakers will be Jon James, Deputy Superintendent, and Ben Helwig, Chief of Lands and Planning, NPS George Washington Memorial Parkway and David Goodman, Arlington County Bicycle and Pedestrian Programs Manager. The meeting will be held on Wednesday, September 18, at 7 PM, in the Prospect House Condominium Meeting Room (enter from the 1200 block of N. Oak Street). The Rosslyn metro station renovation provides a good opportunity to keep Rosslyn safe from Clarendon and ensure that Rosslyn remains at the forefront of stylish bike parking. David Goodwin won't be there. But David Goodman is still planning on coming. Sorry for the mistake, and thanks for the correction.